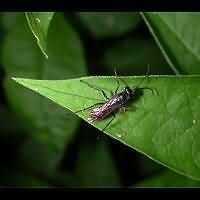 Some wasps are able to sting people painfully, but there are more wasps that have a rather unpleasant character. 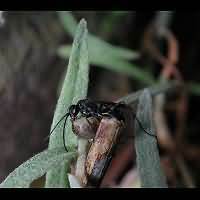 There are lots of wasps that lay their eggs in other animals, which are then completely eaten by the larva of the wasp. 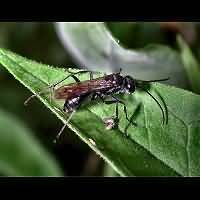 Some wasps simply deposit there eggs on other insects, but some are ready to go to all lengths, such as the spider wasps. For their larva they seek a much bigger victim, e.g. a spider larger than they are themselves. They sting the spider, which deadens the animal. They then take it to the nest, put the spider in and deposit an egg in or near the spider and seal the nest. Because the spider is just deadened, not killed, the larva has a fresh meal when it hatches. 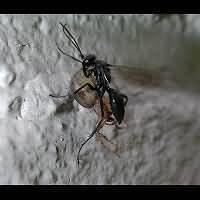 On this page you see the Common Spider Wasp going about with a deadened victim. 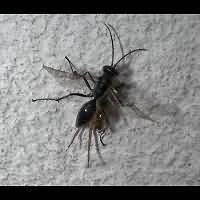 In order to make transportation of the victim easier, this Common Spider Wasp often bites off a few or all of the victims legs. So it is a good thing the wasp uses some kind of anaesthetic! This page has last been modified on Sunday, December 11, 2016. © (2000 - 2019) www.gardensafari.nl (Hans Arentsen) To use one of our pictures email me (hans@gardensafari.nl).